In 1994, Ron Goldman and Nicole Brown Simpson were brutally murdered at her home in Brentwood, California. O.J. Simpson was tried for the crime in a case that captured the attention of the American people, but was ultimately found not guilty of criminal charges. The victims' families brought civil cases against Simpson, and he was found liable for willfully and wrongfully causing the deaths of Ron and Nicole by committing battery with malice and oppression. In 2006, HarperCollins announced the publication of a book in which O.J. Simpson told how he hypothetically would have committed the murders. In response to public outrage that Simpson stood to profit from these crimes, HarperCollins canceled the book. A Florida bankruptcy court awarded the rights tothe Goldmans in August 2007 to partially satisfy the unpaid civil judgment, which has risen, with interest, to over $38 million. The Goldman family views this book as his confession, and has worked hard to ensure that the public will read this book and learn the truth. This is the original manuscript approved by O.J. Simpson, with up to 14,000 words of key additional commentary.--From publisher's description. 5. 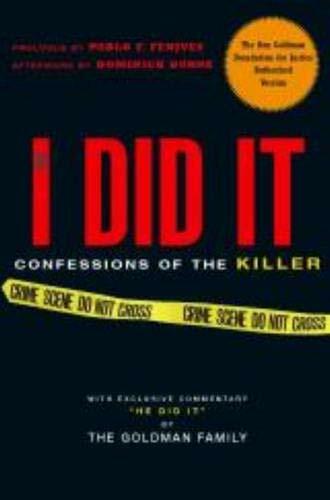 If I did it : Confessions of the Killer The Goldman Family; Dunne, Dominick and Fenjves, Pablo F.